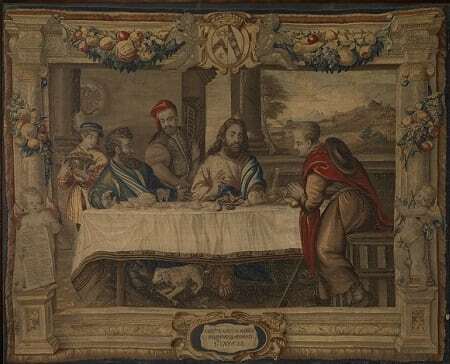 The tapestry is one of three surviving copies of Titian’s ‘The Supper at Emmaus’ produced at Mortlake; the others being located at Hardwick Hall, Derbyshire, and St John’s College, Oxford. The original painting had been purchased by Charles I from the Duke of Mantua in 1627 and was one of several paintings in the king’s collection to be copied by designers at the Mortlake Tapestry Factory. The factory had been established in 1619 by Sir Francis Crane on the initiative and under the patronage of James I. Tapestry-making was a costly enterprise, requiring expensive materials and a skilled work-force, and had not been carried out on a commercial basis in England before this date. During 1620 Crane employed some fifty tapestry workers from the Low Countries and in 1623 James I managed to obtain permission to bring leading designer Francis Cleyn or Klein to England to work at Mortlake. Despite periodic cash-flow problems, Crane successfully directed the factory until his death in 1636. Tapestries continued to be made there until the end of the seventeenth century, although the Civil War, financial difficulties and the death of Cleyn in 1658, contributed to a steady decline in quality and output. In 1667, the factory and its contents were given away by Charles II as a ‘free gift’ to his Cofferer, Henry Brouncker. By 1702 the buildings were described as old and ruinous. ‘The Supper at Emmaus’ in St George’s Chapel almost certainly dates from the 1660s, since it bears the arms of Sir John Mordaunt, topped with a viscount’s coronet. A staunch royalist, Mordaunt was made Viscount by Charles II in March 1659 and appointed Constable of Windsor Castle in 1660, a position he held until his retirement in 1668. He died at his house in Parsons Green, Fulham, in 1675. According to tradition, his widow, Lady Mordaunt, subsequently gave the tapestry to the Dean and Canons. However, an observant researcher has noticed that it is shown behind the Chapel’s High Altar in an engraving by Wenceslaus Hollar published in Elias Ashmole’s history of the Order of the Garter in 1672, years before Viscount Mordaunt’s death. Leave was given to the Lord Mordaunt (upon his letter) to lodge his Lady in Dr Broun’s house, for the time of her lying Inn, and the letter ordered to be ingrossed in the Chapter booke, that it may appeare to be an Act of favour from the Chapter, and not as any right in the said Lord as Constable of the Castle of Windesor. I suggest that the tapestry was given to the Dean and Canons in gratitude for this favour, or a similar one, or as a parting gift on the Constable’s retirement in 1668.